Finally finished the last 2 pieces for last year, and put up some pix on my blog at FibreFan on this link. Enjoy, and thanks for being your inspirational selves and good luck for 2011. I have just finished the seventh ...really late, sorry! it's for one of my childrens and his passion for Aboriginal Art. March wasn't as nice and easy as I expected and my piece reflects that. I worked on it all month and it looks like I felt! If you want to check it out, it's here. year. I finished it last night and I am going to make it in a pin. go and am going to be able to finish 7 more. If anyone is checking for 2010 updates, I'm including a link here to my January and February pieces. I'm actually keeping up this year (for the first two months - ha ha) and have ideas for March. Hope everyone is staying warm and finding time to bead! Just ended the last two months : July is APOTHEOSIS and August FULFILMENT !!! So, now bye to this year et see you on the BJP2010 !!! Want to help but feeling helpless? What can a lone crafter do to help alleviate the suffering? Check out crafthope.com or crafthopeforhaiti where you can donate your crafts which can be sold for donations to Doctors without Borders. First of all, I want to wish you a wonderful creative New year. I'm really late and I've only finished my square #11 for the 2009 project. My August page is finally done! I am so happy that I have finally finished my last page! Started nearly a year and a half ago, it's about time it was posted! Yikes! Last Day to Register for 2010 BJP... Pictures! If you're undecided, take a look at my blog, here. I just posted pictures of some of my favorite pieces from the past year of the BJP... 42 pictures (most click-to-enlarge)... work by 40 of our participants!!!! I was erratic at saving pictures, so I didn't get all of my favorites. Also some members don't have a blog or didn't post pictures to the website. However, the pictures I posted will give you some grand inspirations and incentives to join the 2010 BJP!!!! PSS... Thanks for your well wishes about my Mom. During the week I was in Minnesota, she rallied nicely. I'm hoping she'll make her 93rd birthday in January! My dear Mom took a turn for the worse a week ago and we thought her time among us was at an end. So my sister (who lives in Everett, WA) and I flew back to MN to be with her. Luck for us, she has rallied and we are spending some quality moments with her. In the meantime, I've been having a little time to bead again with Julie, Pam and Brenda, all three BJP participants living in St. Paul, MN! Tomorrow we're going to Pam's for another session. We're having great fun talking about our ideas for BJP 2010. Brenda's working on a special beaded box that will hold her 2010 pieces. I won't spill the beans about it, but it's going to be amazing! Pam's talking about wanting more texture, more dimension to her pieces. Julie is still very undecided. Me too, although I have lots of ideas and I'm pretty sure I'll do some shape other than 4x6, the postcard shape I've been using for the past two years. Will you be with us? I hope so!!!! There are only 5 more days to register. Really, truely, it is not hard. If the registration information on our website seems to difficult or doesn't work on your computer, just email Pam T or me and tell us you want to be in. We'll take care of it. One current member emailed me to say she hadn't finished this year's pieces yet and therefore felt she shouldn't do it again. My answer is this: Don't be bogged down by last year's business... If you think you'd like to try it again, go for it. Let 2008-09 rest and move on!!! May you all have a deliciously wonderful holiday season. May your stockings be filled with fabulous beads! Okay, so it's been a couple weeks since I did an update… call me lazy or busy or whatever you like! We are getting LOTS of new registrants! Please, oh please, past participants, get your registrations in!!! You only have till December 15th to register and we don't want to lose you! 29 NEW participants AND 7 RETURNING participants. Total registration so far: 214!!! I took Robin Atkin's "techniques for Bead embroidery" class this past Friday and have been re inspired! I had quit on several months, leaving them semi-finished. I had not been able to figure out ways to make the backs look good, I had run out of steam and ideas on the beading on some of them and just called them finished. and I still have one month that has been sewn but not beaded yet. Okay, off the computer and back to some beading... next I hit the joann's on black friday to get an Ott light for cheap! Yay! There will be a third Bead Journal Project! For information, see here or the BJP website, here. Your Photos on BJP Website!!! We have three BJP blogs because Blogger only allows 100 authors per blog. We have 260 members, so in order for everyone to be able to post, we need 3 blogs. We hope you'll visit and comment on all three. A step by step tutorial on how to set up your own blog can be found here. Visit the Bead Journal Project website! Visit the 2008 BJP member pages, a gallery of completed work by members who have finished 8 or more pages during the first year of the project. The 2008-09 BJP, starts with September and continues through August of 09. Guidelines for participation may be found here. To be an official member and to post to this blog, you must have registered prior to August 15, 2008. We have our own BJP Flickr group, where we can post pictures of our work. This is a good way for members who do not have a personal blog to post pictures. Also, you can see many BJP pieces by different members in one place. You must "join" Flickr to post your pictures. 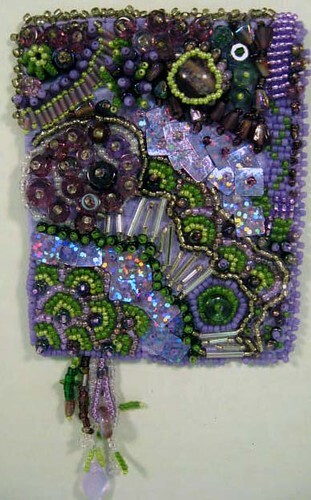 The brain child of Robin Atkins, the first Bead Journal Project, which began in June of 2007, included 241 women and 1 man who were dedicated and committed to creating 12 bead journal pages, one per month, for a year. 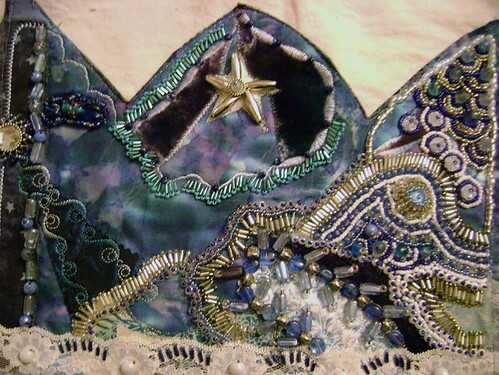 The BJP is all about visual journaling using any media and techniques, providing it includes some beading. We are free to structure our bead journal pages any way we want, as long as all 12 are the same size. 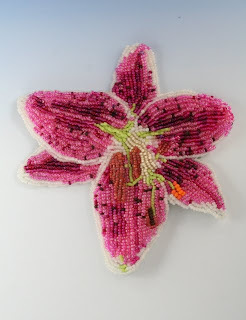 The current years' Bead Journal Project runs from September, 2008 through August, 2009. This blog is a means by which we may support each other in process, techniques and design. Participants (many with links to their personal blogs or websites) are listed below. Add me to your blog! !